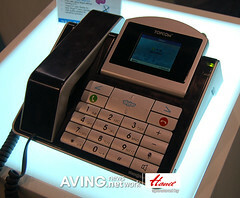 Topcom presented its PC-less wired Skype telephone at Hong Kong Electronics Fair 2007 – WEBT@LKER 5000. It allows to you communicate with your Skype friends for free or use Skype-out to call many places all over the world at very low rates without having to switch on your computer. You need just connect the WEBT@LKER 5000 to the broadband Internet connection via some router and it will be ready to make internet phone calls. To make your work with Skype easier the phone has a large 2.4” color display and useful hardkeys, echo cancellation technology and high quality speaker for handsfree operation. Additionally, using Topcom Wireless Expansion Kit the WEBT@LKER 5000 can be connected to the wireless network as well. No any words about price and availability yet. Mobotix has a brand new intelligent IP camera in the form of the M22 that can survive even under the most extreme of industrial environments such as mining and manufacturing. The M22 is capable of providing clear indoor and outdoor as well as day and night visualization without missing a beat. Additional features include a 4x digital zoom, video frame rates of up to 30fps in VGA resolution, and full 802.3af Power over Ethernet standard. You can install the M22 to support either security or process monitoring applications. A built-in microphone and speakers round off the list of specifications, enabling you to achieve audio functionalities like VoIP and SIP telephony with video. D-Link released a new dual-mode phone line – V-Click. The new phones will allow to make calls via 900/1800/1900MHz GSM/GPRS networks or VoIP using available WiFi connection. There is a special button to enable/disable VoIP connection. Once enabled, users can make SIP-based VoIP calls or hit the web over the bundled Opera Mobile browser and 176×220 pixel display. Data storage – up to 24 megabytes for documents, images, music and video files. 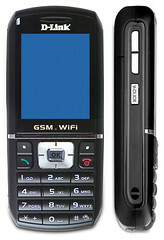 The V-CLICK dual-mode, tri-band mobile phone is scheduled to ship early next year at recomended price $599.99.